Like many birders who visit New Passage in the winter one of the first species you see are the roosting Teal stacked on the far muddy bank. Out of habit of more than 30 winters I quickly scan through the drake birds hoping to see something of American origin. On 27th December I arrived just after high tide (at 2.50pm) in a strong south west wind. The open river was quite choppy but the mouth of Chestle Pill was flat calm due the shingle beach and sea defences forming a wind break. 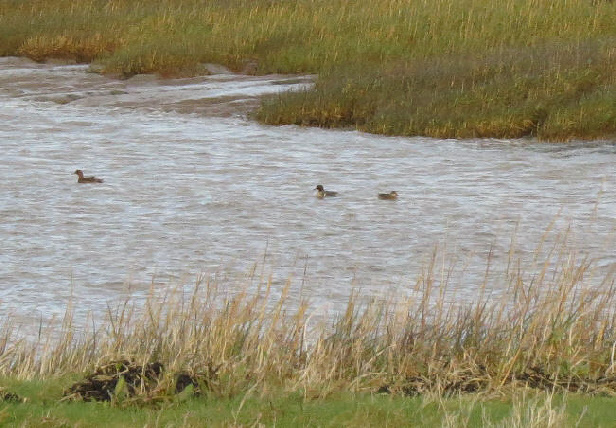 I scanned through the 30 or so visible roosting birds on their usual ledges and then noticed 3 female Teal with a Wigeon and one other small duck swimming at the mouth of the creek. I was sure the final bird had white “braces”. I moved 20 metres closer down the beach and just over the brow of the vegetation I confirmed the presence of a vertical white stripe on each side of the breast. I quickly fired off some distant record shots before all of the birds flew 300 metres north along the shoreline and were lost from view for 20 minutes. A group of Teal eventually appeared distantly on the exposed shore and through my telescope was able to relocate the bird. It remained here until dark. Below are some of the pictures taken in poor light.